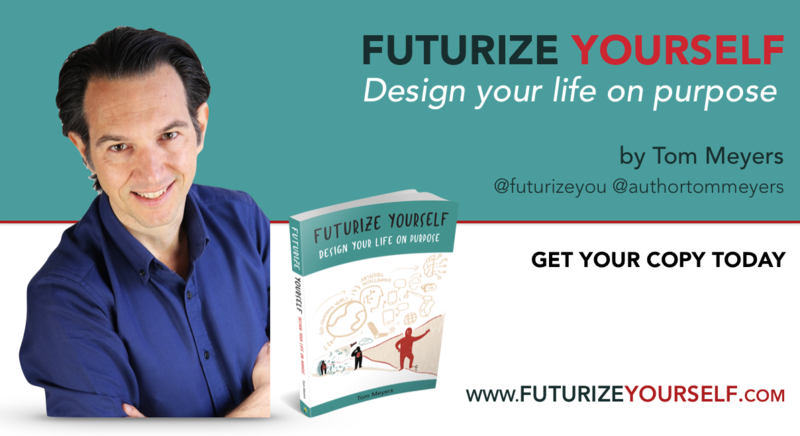 I'm so honoured and grateful that you've decided to help me to get the word out about my first book "Futurize Yourself - Design your life on purpose." Futurize Yourself is the story how three questions saved my life, eighteen years ago. Yes, I can honestly say that questions saved me, they saved me from what had become a life without purpose nor meaning, a life that I wanted to end. When I started to write this book four year ago (is it really that long ago), it was all about sharing my experience of finding meaning and purpose through these three questions. Little did I know of the importance that the quest for meaning and purpose would have in the world of today. This only became apparent when writing the last part of the book. While writing on how to design a life on purpose from a future perspective (ten years from now), I was watching a YouTube video by Gerd Leonhard on how technology was changing our world with a speed, scope and complexity never seen before. I panicked was meaning a purpose still relevant in more automated and technological advanced world? The quest for meaning and purpose in a fast-changing world is more important then ever before, if we want to stay relevant - when machines become more intelligent and better suited for most jobs that exist today - and we need to reinvent ourselves or become obsolete. So thank you for sharing that message with your network, friends and family and please don't hesitate to contact me for more information, a chat or a coffee when you are in Brussels. Check out the links below for samples of copy and images that you can use in your posts. Thank you an be good to you, always.